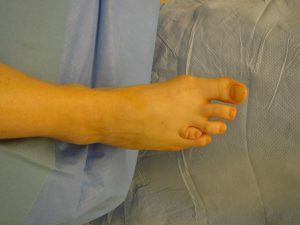 Conservative treatment for brachymetatarsia involves wearing modified shoes that allow more room for the shortened toe that tends to drift upwards. Padding is used to protect the toe from the top of the shoe, and specialized orthotics can be used to relieve pressure from the other toes. Surgical treatment aims to correct the deformity via lengthening of the affected metatarsal. There are currently two surgical techniques for correcting brachymetatarsia: acute and gradual lengthening. Acute lengthening uses a bone graft and is only preferred if the required lengthening is less than 1 cm. For length discrepancies greater than 1 cm, gradual lengthening is preferred. Following acute lengthening, the patient must not bear weight on the affected foot until the bone has healed. During gradual lengthening the metatarsal bone is separated with an osteotome and a specialized external fixator (Orthofix Mini-M100) is applied with pins attached to the bone and connected to the fixator. The pins must be placed along the axis of the metatarsal and parallel to each other, to ensure the toe lengthens in the proper direction. The metatarsal phalangeal joints (MTPJ) is stabilized with a thin Kirschner wire. This is done to ensure that the MTPJ does not dislocate during the lengthening. The soft tissues are also rebalanced to allow for proper alignment. The wire is inserted through the tip of the toe and into the MTPJ connecting to the first pin. Currently, we connect the wire back to the external fixator, which allows for greater stabilization. The external fixator allows the patient to bear weight during the treatment. The external fixator slowly pulls the two segments of the metatarsal apart at a very slow rate (0.5 mm per day) which stimulates new bone to form in the gap. This results in increased length. The lengthening is performed until the toe is at the proper length at which point no further modifications are made to the fixator. The desired length is dependent on the starting length of the metatarsal and the metatarsal parabola. The metatarsal parabola is the angle formed connecting the ends of the first and second toe and the ends of the second and fifth toe. You will notice in a normal foot, the end of the foot has a parabolic shape. Preoperative planning is important to measure the necessary length required to restore the metatarsal parabola. Prediction of required length will also indicate the time required for lenthening. For example, if the metatarsal needs to be lengthened 10 mm, it will take 20 days of lengthening (based on 0.5 mm per day). It is very important that the proper length is achieved and that the surgeon does not over-lengthen. Over-lengthening can result in joint stiffness, secondary deformities, and pain. Follow up visits are scheduled every two weeks during treatment to ensure that over-lengthening does not occur and to monitor for complications such as premature consolidation and nonunion. For more information, please see Treating Complications. After the lengthening, the fixator remains until the bone consolidates. Once the bone has completely consolidated (verified via x-rays), the external fixator can be removed.